Pullman is now a National Monument! 3rd Annual Pullman Day-Before-Father's-Day Music, Poetry, Art, & Dance Jam @ Argus Brewery on June 20 @ 6p-10p! Coop Op Harvest Festival and Haunted Lot! - a celebration of here, here. Limited seating - Your must reserve your seats through brownpaper tickets. From Slave to State Legislator: John W.E. 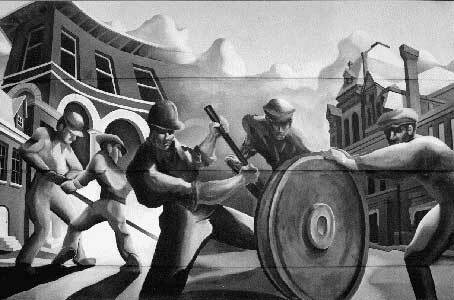 Thomas, Illinois’ First African American Lawmaker with author David Joens Sunday, February 23, 2014, 3 p.m. to 5 p.m.
"Community" - an interactive chalk mural on 111th and St Lawrence. What is your vision for a contemporary utopian community? October 19-20, 2013 150 site throughout Chicago - 6 in Pullman! Free! 40th Annual House Tour on Saturday, October 12 and Sunday, October 13, 2013 Click here for info and advance ticket sales! Support Chicago Bike Share in Pullman! Click here! 19th Annual Garden Walk. The Historic Pullman Garden Club invite you back to the Victorian era of the 1880s during the Garden Tea and Tour on Saturday July 13, 2013, from 10 a.m. to 4 p.m.
Join the National Parks Conservation Association in their support of establishing the Historic Pullman District as Chicago's first national park. Add your name to the list of signers today. Pullman Community Organic Food Garden 2013 Chili Cook Off Sunday, April 14, 2013 1:00pm until 4:00pm at the Pullman Factory Site $5.00 admission goes to support the community food growing effort in Pullman. YUM! Pullman Candlelight House Walk - Sunday Dec. 9th, 4pm-6:30pm, with reception and silent auction until 7:30pm. You are cordially invited to the official Launch Party of the Pullman Art Space Survey! Monday, October 29, 2012 - 6:30pm until 8:30pm at the Pullman Factory site. The Historic Pullman Foundation and the Pullman Civic Organization will host their 39th Annual House Tour on Saturday, October 13 and Sunday, October 14, 2012. South Of The Loop Art Show Saturday, October 13, 2012 to Sunday, October 14, 2012 at the Factory site. The Grammy Award-winning Mariachi Divas on Saturday, June 23rd, 2012 at 7PM in the Historic Pullman Clock Tower - Factory building. This event is free, family-friendly, and public. 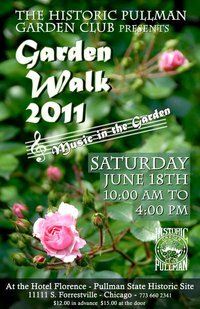 18th Annual Pullman Garden Walk - "Art in Bloom" on Saturday June 16, 2012, from 10 am - 4 pm. George M. Pullman's 181st Birthday Party - Saturday, March 3, 2012 - 1:00pm until 4:00pm FREE! "Through the Needle" Trailer - A short-film from The Inner Below Starring: Steven Saines, Katie Gamble and Sara Sylvan. Written and Directed by Benjamin Capps. Mosnart artist Gyun Hur - "I Dreamed Your Utopia... "
Pullman & Gately Park Farmers Market – Wednesdays, mid-June thru October - 111th Place & Cottage Grove Avenue (Arcade Park). Free Parking. Stop by and take a look at the progress! Directions to Pullman via road or train. - Come visit Pullman Soon! A bulletin board for buying, selling, trading, and bartering goods and services within Historic Pullman... all new!